I always wanted to try something new, so when I saw a paintball deal I happily bought it! It was a good deal, we paid PHP199 instead of PHP500 for an all day pass to any Global Gutz. That included the full gear, equipment and 20 bullets. We were late but the people from Global Gutz are still accommodating, thank you guys! We had to pay additional PHP50/pax for the Eco park entrance fee and PhP2.50 each for extra paint balls. 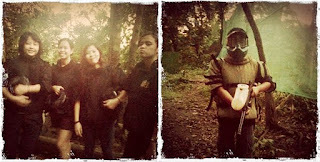 The paintball area have a good setup and it automatically triggered our adrenalin. Tips and tricks. One good tip is, wear the proper attire to complement your gear. It should be color black or dark brown or anything that can blend on nature - no orange or yellow please. You should also wear the right shoes so that you'll concentrate on the game rather than on slipping or losing your slippers. And don't wear shorts especially if you have fair complexion - or you'll end up like me, an easy target! I have salonpas and bruises to support that statement! To be fair, I thought the gear included pants as seen on the promotional photo =) That's my excuse! Girls 2- Boys 1. Anyway, each round lasted for 15 minutes and it was the longest 15 minutes everrrr! The 3rd and last round was held around quarter to 6pm so it was very dark and we cant see anything! Also, it turned out that 20 bullets wasnt enough for trigger happy first timers so we gladly paid for 75 bullets more per person. Everyone should try it! 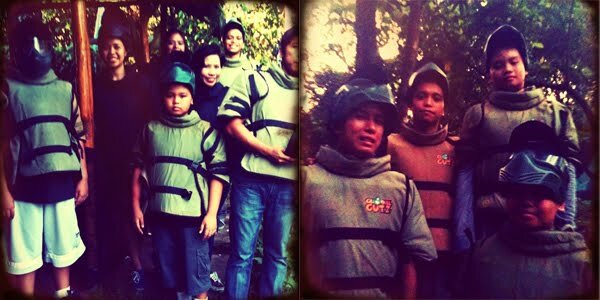 We sweat a lot for 45 minutes of paintball action, its a great exercise and builds a different bond with family and friends! Its definitively something that I'll try again!